Russia’s relations with South and North Korean are critical to the country’s stability and interests. Vladimir Putin had two reasons to visit Seoul on November 12 and 13: security and security. And no, that is not a typo. It's the harsh reality that Russia faces in the Asia-Pacific region. The first reason is related to the Korean conflict. North Korea, of course, shares a border with Russia, and is located close to the most strategically sensitive area in the Russian Far East – the port city of Vladivostok. The Korean governments are still formally at war, and only have an armistice agreement that was signed July 27, 1953. Escalating confrontations and local skirmishes in the conflict could harm the Russian population, block sea and air transport, and cause an influx of refugees, even in the best-case scenario. At worst, the problems could be even more severe. The Korean conflict, in which the United States supports South Korea, has driven Pyongyang to develop nuclear weapons and missiles capable of delivering them. North Korea conducts its nuclear tests and missile launches at a location only 150 kilometers to 300 kilometers (90 miles to180 miles) from the Russian border. With every test, the preparedness of Russia's military and civil defense is ratcheted up. 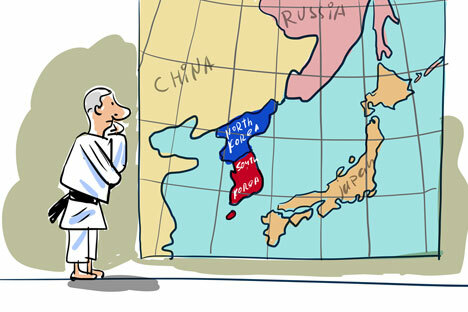 The consequences of its deployment would be catastrophic for the whole northeast Asia region. This is why Moscow is extremely concerned about North Korea's nuclear program. However, Russia can certainly not stop them by itself. Putin reaffirmed his position on this issue in Seoul. In addition, the Russian president called for renewed six-party talks on the North Korean nuclear issue (North and South Korea, Japan, the U.S., Russia, and China). "I believe that the most important task before us is to unblock these negotiations, renew them, and remove all the obstacles that are hindering the beginning of the process. If we will keep constantly putting forward preconditions for the negotiations, they might never get off the ground," Putin said in an interview with South Korean Broadcasting System on the eve of his visit to Seoul. It could have sounded like the familiar mantra, if not for the Syrian situation, where Russia and the United States succeeded in beginning the process of destroying Syria's chemical weapons, or the marked acceleration in nuclear negotiations with Iran, in which Russia has also played a role. These are unexpected and effective steps that are defusing tensions in the Middle East and helping to prevent the proliferation of weapons of mass destruction, on which modern world order depends. This is the perfect time to try this approach in the Korean Peninsula. At the same time, Putin discussed some of Russia's own proposals for getting the two Koreas to talk. "Trilateral cooperation should not be held hostage by politics, but on the contrary, should be an important unifying and reconciling factor," he said at a news conference following the Russian-Korean talks. He was referring to cooperation in the transportation and energy sectors. Firstly, this means restoring the Trans-Korean Railway and connecting it to the Trans-Siberian Railway. The president noted that "this is not just an initiative that exists only on paper." Russia has already taken steps to put it into motion. Russian Railways has repaired a fairly large section of the railway in North Korea, building it almost from scratch. Commenting on the "Eurasian initiative" of the new South Korean president Park Geun-hye to create a single transportation network linking North and South Korea, China, Russia and Central Asia, Putin stressed that it is fully consistent with the Russian initiative. Secondly, there is the project to build a gas pipeline from Russia across the Korean Peninsula. The idea to put the valve on the pipe leading to South Korea in the hands of the northerners is seen as rather risky. However, if it works, it would be a step towards building confidence between the North and the South, and thus could lessen the threat of conflict. Seoul has not dismissed the idea, it even formalized it in a joint statement, but it is understandably taking time to examine the issue. It is worth noting that this security issue in the context of the Korean conflict relates directly to Russia's security as a whole. Putin's proposal for trilateral economic cooperation, as well as the economic agreement signed in Seoul, are both consistent with the doctrine announced last year in Vladivostok redirecting Russia to the Asia-Pacific region, creating a transportation corridor in Siberia between Europe and Asia, and developing the energy infrastructure in the Far East for transporting oil and gas to large consumers such as China, Japan, and South Korea. It is through international cooperation that Putin intends to revitalize the currently depressed Siberia, a region that Russia depends on more than nuclear missiles. For now, Moscow sees its main partner as China, but it is clearly aiming to diversify. "Our traditional partner is China. This is good. But we should not develop in just one direction, we need to intensify Russia's Asian diplomacy in other directions,” said Sergei Luzyanin, the assistant director of the Institute for Far Eastern Studies. "South Korea and Vietnam are the best choices for diversifying Russia's Asian policy by taking advantage of all of Russia's resources."